Nothing fancy here. Just good old pizza. Cooked these at 700 degrees for 4 minutes. 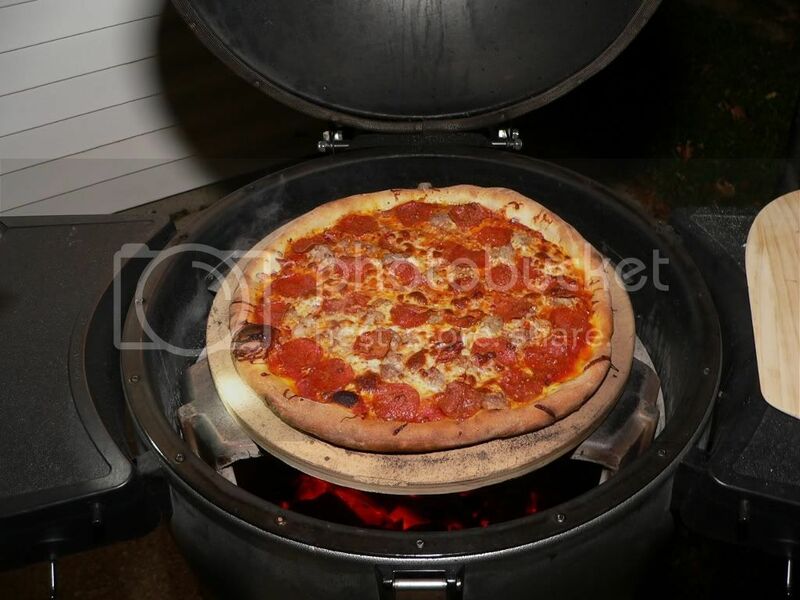 Use the BGE plate setter with the legs down and my pizza stone on top. Preheated the keg for about 45 minutes. I really like how it cooked the top. Very even cooking top to bottom. Here is the dough recipe I used. Mix flour and IDY in one bowl. Mix cold water, salt, and oil in another bowl until salt dissolves. Gradually add flour and mix until a ball forms. Once it balls together knead for 5-8 minutes by hand or machine. Put in a oiled bowl, cover and put in the fridge for 24 to 72 hours. Remove from the bowl and put on the counter covered with plastic wrap to rise for 1-2 hours before forming into pizza skin. Stretch by hand or roll to make a skin. I use about a half a can of store bought pizza sauce per 14" pie. Top any way you like. Can be cooked at 500-550 degrees and takes about 7-8 minutes at that temp. Higher temps require less cook time. This make a 14" pizza. If you need help converting it to a different size pie let me know. 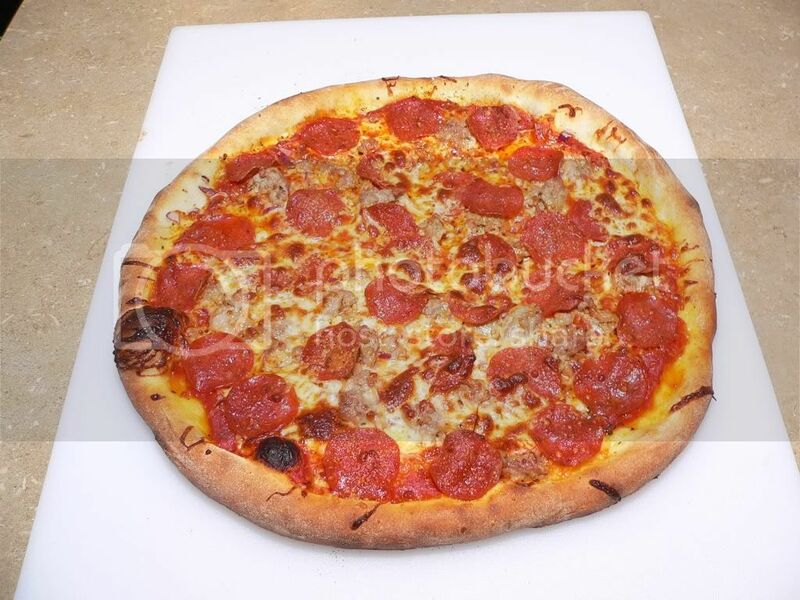 Here is a link to my beginner thread at pizzamaking.com. It kind of walks you though the dough making. First one is just cheese and pepperoni for the kids. 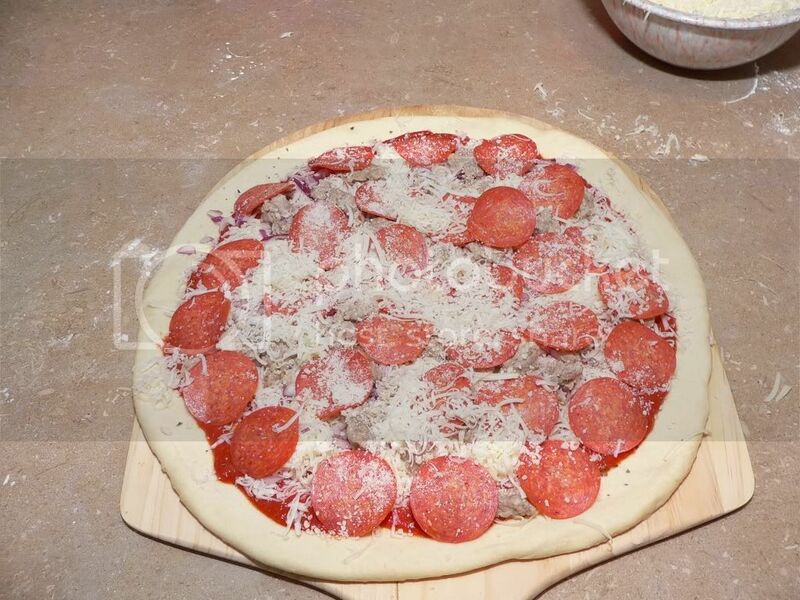 Second one was cheese, sausage, red onion, and pepperoni with grated parmesan cheese on top. Give me a cold mug of draft beer and a couple slices of that bottom pizza and I'm good to go. Looks great. Hey Vindii, first of all, nice looking pies you have there brother. 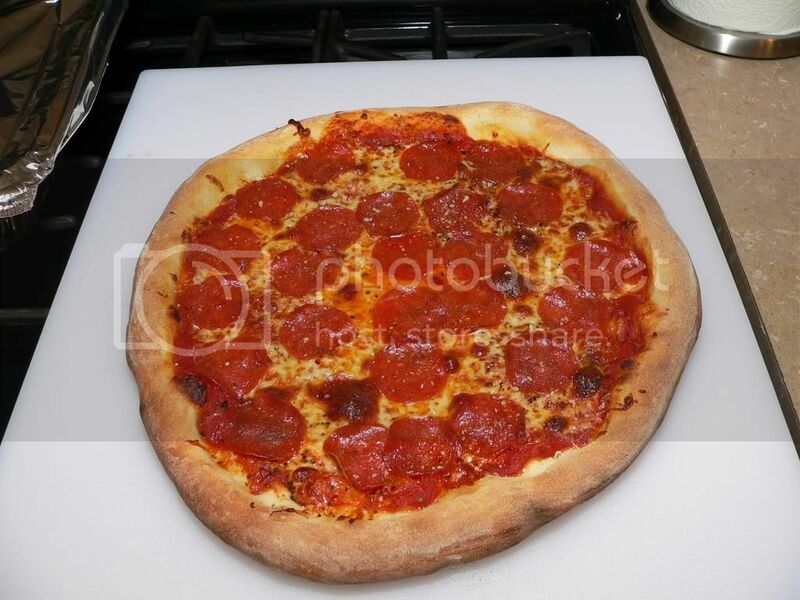 I have seen some of your posts over on the pizza making forum, they always look good. 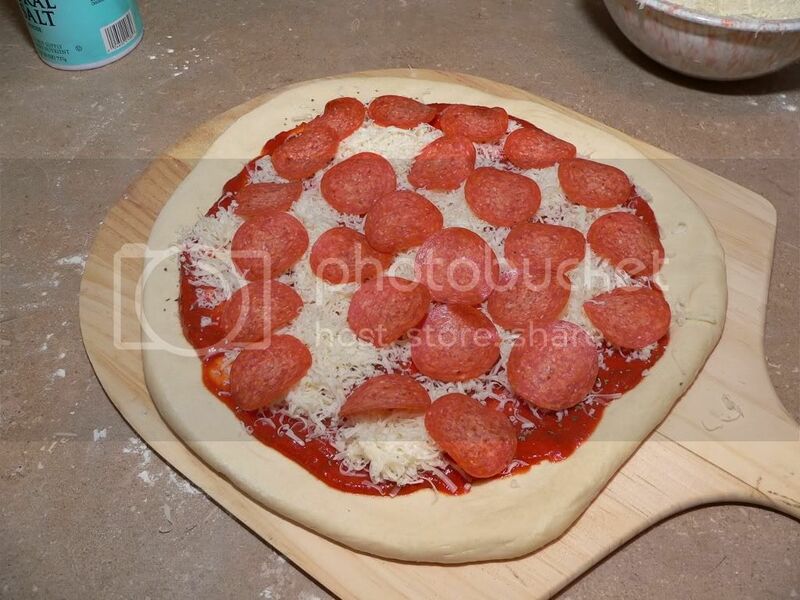 I am a big fan of the style of dough you have here, do you have a recipe you can post, or a link to the pizza forum where this might be posted. Thanks! Top notch pies once again!!! Great looking pizza. Who needs an oven. Alright...you have officially inspired me! I'm going to make my own pizza instead of just cooking store bought. 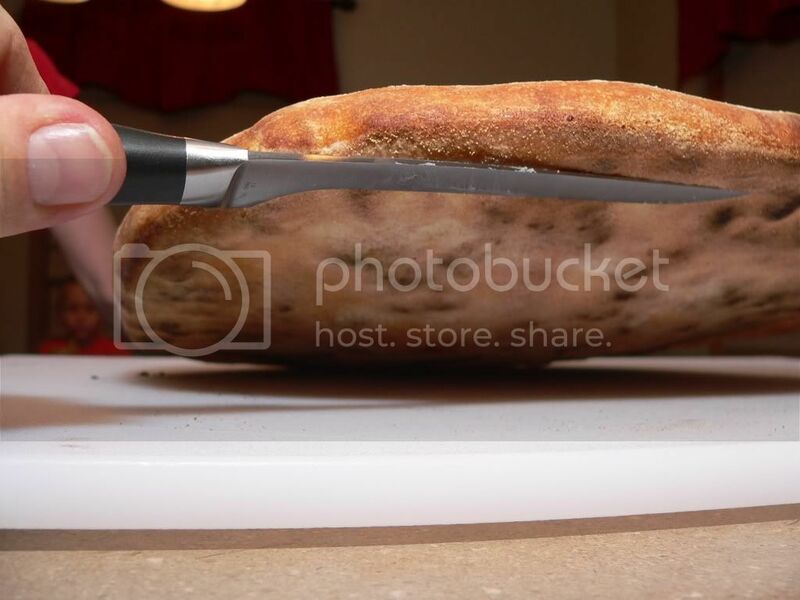 Having said that...how long to you let this dough that you used sit? couple hours or a day or more? Thanks for posting the link. Its funny, I just read that whole thread a few weeks back. I just re read the whole thing again, and that calzone you made looks outstanding. I am going to try this dough tomorrow. If you edited your first post to include this dough recipe I think I could move it to "Recipes"! This dough need to ferment for at least 24 hours. Can be left for up to 3 days covered in the fridge. Other recipes can be used faster or can sit longer by adjust the ingredient slightly. Mostly yeast amount I believe. I'm sending this where it belongs!